Sri Patna Sahib is the birthplace of Guru Gobind Singh Ji who was born on 22nd December in the year 1666. Guru Gobind Singh Ji spent his early years here before moving to Anandpur. 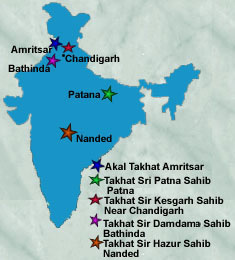 Patna was also honoured by visits from Guru Nanak as well as Guru Tegh Bahadur. The Harmandir Takht, the gurdwara that commemorates Guru Gobind Singh, is a sacred place of pilgrimage for the Sikhs and is considered as the second holiest Takht. 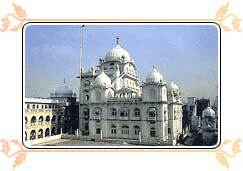 To the Sikhs this holy place is reverentially known as Patna Sahib. Regarded as one of the holiest of the five takhts, it is situated in one of the old quarters of Patna City. The place once known as Kucha Farrukh Khan is now known as Harmandir Gali. Salis Rai Johri, a great devotee of Guru Nanak was so much influenced by his teachings that he converted his opulent haveli into a dharamshala where Guru Tegh Bahadur also stayed. This is the place where the holy shrine of Harmandir Sahib is now located. The work of reconstructing the Harmandir in 1839 following destruction by fire was started by Maharaja Ranjit Singh started who did not survive to see the new structure. In 1934, when an earthquake rocked the entire Bihar some portion of Harmandir fell down. Construction of the present building was taken up on November 19, 1954 and was completed in about three years. Quite a few relics of the Guru Gobind Singh Ji are also preserved in this shrine that include a 'pangura' (cradle) with four stands covered with golden plates, four iron arrows, sacred sword of the Master and a pair of his sandals. 'Hukamnamas', the written orders of Guru Gobind Singh and Guru Tegh Bahadur contained in a book are also kept in this holy Gurudwara. The holy place of the Sikhs has grown up at Jhauganj (Chowk) of Old Patna around the birthplace of Guru Gobind Singh. A museum with Sikh dynasty in painting, footwear of Guru, swing and many other articles can be seen at the ground floor. Listen to the celebration of Patna Sahib sung by the late Giani Udham Singh.